Owning a luxury boating vessel such as a yacht is rewarding and potentially nerve-racking due to the possibility of vandalism, robbery, and pirate attacks when out on the open sea. 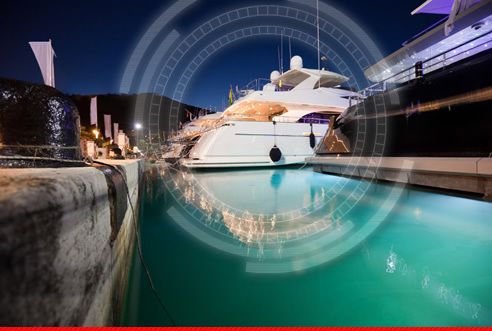 Where yacht insurance and full security forces fall short or are too costly, Odin Systems specializes in custom, state-of-the-art video surveillance and camera systems that utilize Mobotix high-end, high-resolution cameras. Our engineering combined with Mobotix technology help thwart vandalism and crime no matter where you decide to venture. Our security solutions are engineered to mitigate external and internal threats and record activity on and around the vessel. The system we employ uses exemplary technology and a digital forensic process, which means reduced recovery time of captured footage and outstanding quality of final imagery. Odin uses Mobotix camera solutions because they produce some of the highest resolution images available in the industry. One single Mobotix camera delivers a 10 megapixel image and records about 30 times more detail than a standard security camera. This allows for larger areas to be recorded, up to 360° views in fact, which reduces the number of cameras needed. Compared to lesser video surveillance options that only produce blurred, pixelated and black and white images, our solutions are clear, crisp and capable of capturing minute identifying marks on suspects including tattoos, scars, moles and birthmarks. Our images are also accepted as forensic evidence in a court of law, whereas other surveillance images are not. --> Remote TCIP control over indoor and outdoor camera sites allows crew to effectively monitor threats in real time and the ability to communicate to on-land emergency response providers in seconds. --> Dedicated high speed broadband connection means real time response capabilities, minimal or no interference from other frequencies and high-quality picture delivery. --> Cutting-edge, high resolution Mobotix cameras allow for exceptional detail even in low light situations making facial recognition, loss recovery and criminal prosecution likely and swift. --> Allows Captain and crew to identify questionable activity in or around the vessel before any crime has occurred. --> System integration with mobile iPad technology allows crew to monitor and track guests, deliver food and cut down on guest wait time -- all highly important tasks for large service-oriented vessels. --> Captain is able to monitor crew and review inefficiencies and best practices. --> System records any emergencies, pirate attacks and harbor accidents. Contact us for a free consultation and quote on our solutions, equipment or consulting services.